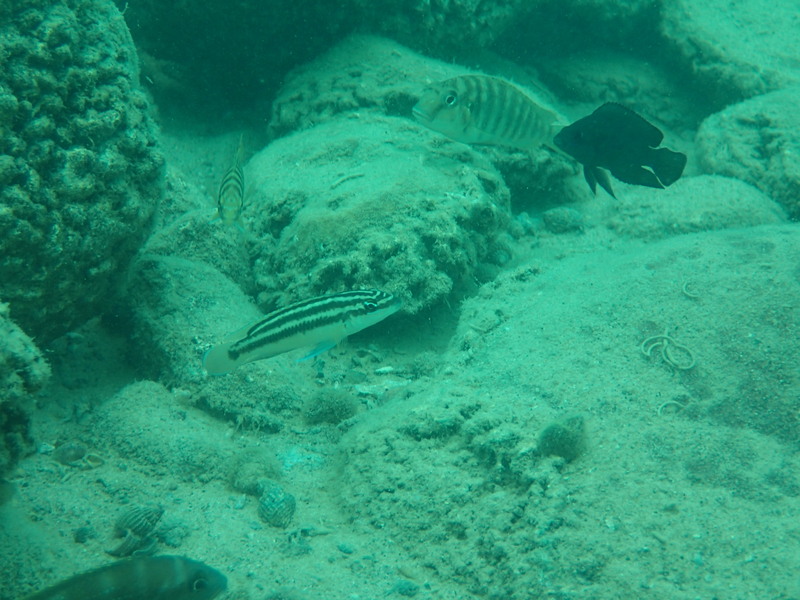 Above: Julidiochromis ornatus – the masked bandit of Lake Tanganyika. Like a few other species here in Lake Tanganyika, J. ornatus is a cooperative breeder; meaning that they form groups in which smaller individuals don’t reproduce (usually) and help raise the offspring of the breeding pair. The cooperative system in the Julies gets a bit more complex however. In the breeding pairs the male or female can be larger, and fish preferentially form groups so that one or the other is substantially larger. When the male is larger, the social system is typically polygynous. This means the male mates with multiple females in the group. In most cases, the female is larger and the system is the opposite. The term for this is polyandrous, meaning “many males,” and she keeps a harem of males around.